Although getting plenty of niacin, a form of vitamin B-3, in your diet helps keep energy levels high, niacin doesn't likely relate directly to weight loss. But eating a well-balanced diet containing plenty of niacin and other B vitamins as part of a reduced-calorie meal plan gives you the best chance at successfully shedding pounds. Niacin and other B vitamins help your body produce energy from the foods you eat. Getting too little niacin may drain your energy, making it difficult to burn more calories than you eat -- an essential component of successful weight loss. Furthermore, many niacin-rich foods help with weight loss because they provide other nutrients, such as protein and fiber, that aid in healthy weight management. Niacin supplements are widely available, and although they may not directly cause weight loss, they can provide you with health benefits during your weight loss regimen. Consuming higher doses of niacin by taking supplements is likely effective for treating high cholesterol -- and possibly effective for helping with osteoarthritis, hardening of your arteries, heart attack risks, diabetes and cataracts. But taking niacin supplements does not cause weight loss. Many foods rich in niacin -- such as lean meats, poultry, dairy foods, fish, legumes, eggs, nuts and enriched whole-grain cereals -- are beneficial when you're trying to lose weight. 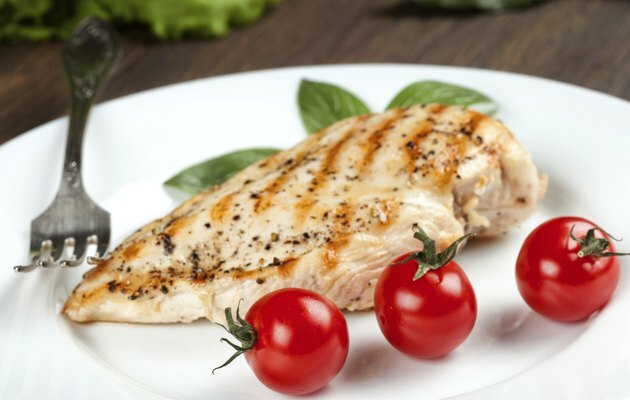 The protein in seafood, eggs, poultry, nuts, lowfat dairy foods, legumes and lean meats helps you feel full and boosts your body's caloric expenditure, according to a review published in 2008 in "The American Journal of Clinical Nutrition." Fiber present in niacin-rich legumes, nuts and whole grains also boosts satiety and helps enhance weight loss. Consumed in recommended amounts, niacin doesn't guarantee you'll lose weight but is part of a healthy weight-loss meal plan. Weight-loss caloric requirements often range from 1,200 to 1,600 calories daily for adults. The recommended dietary allowance, or RDA, for niacin is 14 milligrams daily for women and 16 milligrams for men. PubMed Health notes that dosages of supplemental niacin ranging from 1,000 to 3,000 milligrams daily have been used as treatments for improving blood cholesterol and triglyceride levels. Most people can meet their daily niacin needs by eating a variety of healthy foods, however. How Much Niacin Is Okay During Pregnancy?